Bob Van Ryzin begins the June 4th episode of Coin Chat Radio with information on the 2009 US Mint Proof Set release. It is larger than last year’s fourteen coin set with the addition of another quarter and three Lincoln cents. Accordingly, it is more expensive with a US Mint price of $29.95. In related US Mint coin news, the US Commission of Fine Arts recommended a design of the American Flag for the reverse of the 2010 Lincoln Cent. It has been submitted to the US Mint for final approval. Jeff Garrett, of Mid American Rare Coin Galleries, is interviewed by Numismatic News editor Dave Harper about the new Smithsonian exhibit opening June 12th. According to Garrett, "Stories on Money" will contain several different displays including a "Legendary Rarities" display case. "In that case is going to be just a phenomenal display of about 12 to 15… of some of their best coins," said Garrett. "That includes all three of the 1804 dollars, they have three different types. The 1849 twenty, that’s unique in the Smithsonian collection. They’ve got the ultra high reliefs. Then, of course, 1913 nickel… it’s like all the great rarities of the Smithsonian will be in that case." "In its broadest definition, collecting coins by type requires that you obtain an example of every design that was struck by the US Mint since it was founded in 1792. That’s a tall order. You would be looking for denominations like the ½ cent, 2 cent piece, 3 cent piece and 20 cent piece, which have not been produced in over a century. That’s why type collectors often divide the challenge into more digestible units. Starting type collectors can focus on 20th century coin designs, which are easily obtainable." Lisa Bellavin, Online Editor, closes out this week’s episode with a history on gold coinage beginning with the first coins struck in Asia Minor in the 600s BC, and continuing on through history all the way up to the modern day bullion coins. To listen to this program, go to Coin Chat Radio. 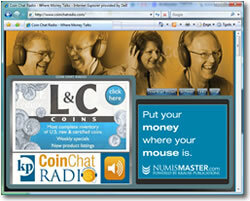 Current and prior week episodes are also available directly from sites hosting the free Coin Chat Radio player, like the one found in the upper right at Coin Collecting News.